Military sims like Arma need a lot of space for their features to breathe, which places a lot of importance on the design and layout of any new terrain. Following up on the reveal of Tanoa at the PC Gaming Show, Bohemia has pulled back a few more of the information-obscuring branches on its "green hell"for Arma 3, due with the game's first expansion in the first half of 2016. One takeaway from the video is Bohemia's status update on the development progress of Tanoa. Creative director Jay Crowe says that the "basic layout, basic shape, structure of the terrain is in place" and that Bohemia has moved on to populating the map itself. 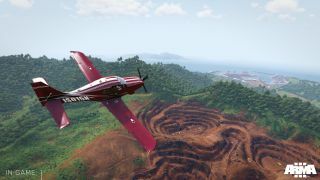 New tech for Tanoa is being worked on, too—the lighting config, a new ocean shader—and it sounds like some of this will be integrated retroactively into existing Arma 3 terrain. Bohemia also, for the first time I think, explicitly mentions Fiji as a prominent part of its source material for the creation of Tanoa. Bohemia sent two of its environment designers to Fiji to gather photo references of structures, vegetation, and other materials, not to recreate Fiji, but to capture its atmosphere as a foundation for what will become Tanoa. Bohemia also mentions that they've tried to do a Pacific map for some time. "We actually considered the Pacific setting for several, unfortunately, cancelled projects in the past," says Joris-Jan van 't Land. Finally, Bohemia teases a new 3D scenario editor coming either with or after the release of the new expansion.